The immune system is made up of highly specialized cells and processes that are designed to eliminate pathogens and prevent the growth of bacteria. When the immune system is “run down” and not functioning optimally this increases our chances of catching the flu. So what do you do once you have caught the flu? Focus on eating healthy foods to help promote the growth of healthy good gut bacteria. Probiotics foods like yoghurt, miso, kefir and sauerkraut promote the growth of beneficial bacteria in the intestines and help to reduce the incidence of developing acute upper respiratory tract infections. Prebiotic foods help to feed the good bacteria. So enjoy eating whole oats, bananas, wheat, barley, Jerusalem artichokes, legumes, garlic, flaxseed, tomatoes and green vegetables. 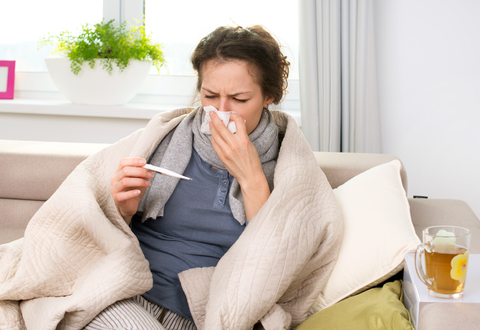 Zinc can reduce the length and severity of the flu by reducing inflammation, regulating immune dysfunction, reducing organ damage, secondary infections and is also safe to take during pregnancy. Echinacea is a herb that has been used for centuries in western herbal medicine to support a healthy immune response and is safe to take during pregnancy. Taken at the first sign of exposure will increase the efficacy of Echinacea. Echinacea regulates and enhances the immune system, reduce inflammation and encourages and improves detoxification. Earthing, grounding or more commonly known as spending time in nature has shown to have an anti-inflammatory effect on the body. Earthing has also demonstrated that is accelerates the immune response following vaccination from avian H5N1 influenza infection. So if you are feeling run down or you already have the flu, give these natural healthy tips a go to support your immune and if you need any additional support be sure to book an appointment with our friendly Naturopath Kim who will help support your immune system and bring your body back to balance.